XO sauce is a spicy seafood sauce that originated from Hong Kong. It is commonly used most in southern Chinese regions like Guangdong province. Developed in the 1980s in Hong Kong for Cantonese cuisine, XO sauce is made of roughly chopped dried seafoods, including scallops, dried fish and shrimp, and subsequently cooked with chili peppers, onions, and garlic. 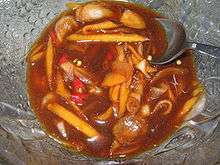 This dried seafood-based sauce bears similarity to the Fujianese Shacha sauce. Spring Moon, the Peninsula Hong Kong's Chinese restaurant, is often credited with the invention of XO sauce, although others claim the sauce's origin in the urban area of Kowloon. The name XO sauce comes from fine XO (extra-old) cognac, which is a popular Western liquor in Hong Kong and considered by many to be a chic product there. In addition, the term XO is often used in the popular culture of Hong Kong to denote high quality, prestige and luxury. In fact, XO sauce has been marketed in the same manner as the French liquor, using packaging of similar colour schemes. Typical ingredients of XO sauce include dried scallop, red chili pepper, Jinhua ham, dried shrimp, garlic and canola oil. Some other recipes also call for salted cured fish and diced onion. 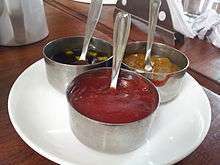 XO sauce can be used as a condiment on the side of main dishes or used in cooking to enhance the flavour of fish, meats, vegetables, and otherwise bland foods such as tofu or noodles. Home cooks often use this sauce as the chief flavouring for fried rice. ↑ Vos, Heidemarie (2010). Passion of a Foodie. p. 591. ISBN 978-1-934925-63-8. ↑ "XO sauce". gourmettraveller.com.au. Retrieved 2012-08-08. ↑ "Vogue China: XO sauce". ↑ "Flavor Ammo: Is XO Sauce the World's Most Baller Condiment?". Grubstreet. Retrieved 2012-08-08. ↑ "Hong Kong's best condiment". CNN Go. 15 October 2010. Archived from the original on August 9, 2011. Retrieved 13 August 2012.